Hail and real slate roofing simply don’t get along. Just ask Jeanie Luskey-Huffman. 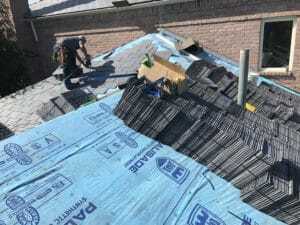 After multiple hail storms caused significant damage to her slate roof, she opted for problem-free synthetic slate roofing from DaVinci Roofscapes. “We loved the real slate roof, but the last hail storm forced us to replace the entire roof because of damage,” says Luskey-Huffman, a Westover Hills, Texas resident. “Our contractor told us about the composite roofing materials from DaVinci and we were intrigued. Selman, who has installed DaVinci composite roofing products for more than five years, didn’t hesitate to recommend a DaVinci Single-Width Slate roof in a European blend of four colors. “Cost was a factor in the decision, along with adhering to the strict guidelines in this neighborhood,” says Selman. “Westover Hills is an upscale city in Fort Worth. They have strict guidelines for architecture, and DaVinci is one of the recommended roofing products in this area. 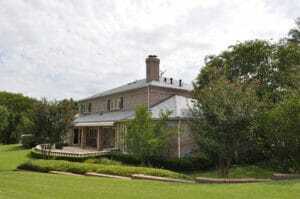 Situated on the Shady Oaks Golf Course with an abundance of views, the Luskey-Huffman home was built about 24 years ago. To top off the expansive 5,579-square-foot house, the original roofer chose a blended Vermont slate. “While the real slate was beautiful, unfortunately the homeowner experienced ongoing maintenance concerns with leaks and cracks for years,” says Selman. “Once the decision was made to re-roof with DaVinci, we were able to confidently attack the roofing project.